The time has come to sell my beloved Bass ‘O’ Nator, i have owned her for 3 years and have had some good times out on the water with her.i reluctantly have to sell due to time restaints and bigger projects to deal with. 25HP yammy, (1984 i believe…its old but it is reliable) Impeller changed last year, spare impeller kit included. Please have a look at all of the photos of the BoN in and out of the water. 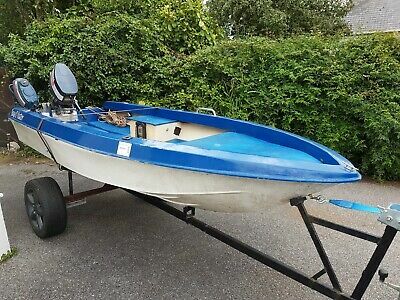 This 4m Fishing Boat boat is located in Penryn, TR10 9BW and is being sold on eBay by firekin77.